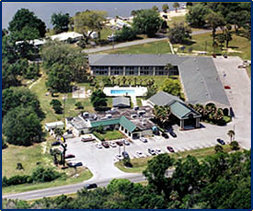 Crystal River Hotel Accommodations with Swimming Pool, Motel in Crystal River Florida Days Inn Manatee Tours. Accommodations nestled in the midst of Florida's Nature Coast. 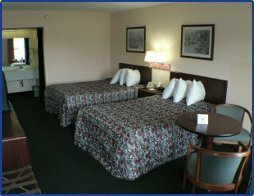 Days Inn Resort specializes in affordable family lodging and on site watersports amenities. Crystal River is located on the west coast about 80 miles from the Orlando airport and 65 miles from the Tampa airport. Relax by our pool while watching the children play in the playground. Small pets are allowed. Enjoy your stay and experience a once in a lifetime opportunity to do something you can't do anywhere else on the planet. Swim with the Manatees. The dive & snorkel shop, Crystal River Watersports, is located right next door on the water. 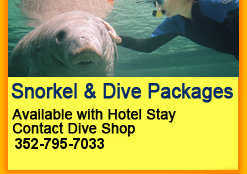 Book a snorkel or dive package with your room and get a special discount on your room, book with www.FloridaManateeTours.com. You can also renta canoe/kayak or take a sightseeing tour, a fisherman's paradise just steps away. Bring your boat, dockage avilable, or book a charter leaving from the property. Other nearby attractions include the Homosassa Springs Wildlife Park, Fort Island Beach, Historic Downtown Crystal River, City Parks, Crystal River Mall & movie theater, waterfront restaurants, local pubs and shops all within minutes.